In the post-genome era attention is being focused on those epigenetic modifications which modulate chromatin structure to guarantee that information present on DNA is read correctly and at the most appropriate time in order to meet cellular requirements. In this chapter data are reviewed which show that along the chain of events that induce DNA methylation-dependent chromatin condensation, a post-synthetic modification other than histone acetylation, phosphorylation and methylation, namely poly(ADP-ribosyl)ation, participates in the establishment and maintenance of methylation-free regions of chromatin. 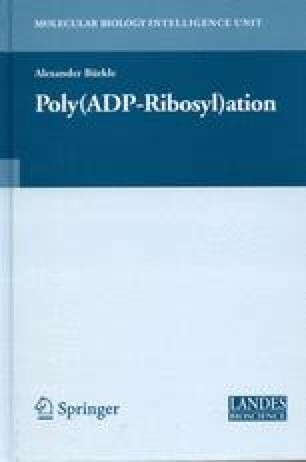 In fact, several lines of in vitro and in vivo evidence have shown that poly(ADP-ribosyl)ation is involved in the control of DNA methylation pattern, protecting genomic DNA from full methylation. Molecular mechanism(s) that might underpin the correlation between inhibition of poly(ADP-ribose) polymerases and DNA hypermethylation will be discussed. Finally the hypothesis is posited that inhibition of the poly(ADP-ribosyl)ation process in the cell may be responsible for the anomalous hypermethylation of tumor suppressor gene promoters during tumorigenesis.